Heightened volcanic activity in the Nevados de Chillán prompted Chilean authorities to issue an orange alert in anticipation of an eruption. Stretching over 4,350 miles (7,000 km) across seven countries, the Andes are the world’s longest mountain range. They make up the southeastern portion of the Ring of Fire and are well-known for their abundant volcanoes. The Chilean Andes are home to 90 active volcanoes, all monitored by the Chilean National Geology and Mining Service (Sernageomin). The agency categorizes volcanic activity using four distinct alert levels: green (normal level of activity), yellow (increased level of activity), orange (probable development of an eruption in the short term), and red (eruption is ongoing or imminent). Increased volcanic activity is associated with frequent earthquakes; plumes of gas, rocks, or ash; and lava flows. Two areas monitored by Sernageomin are currently showing signs of increased activity: the Nevados de Chillán and Planchón-Peteroa volcanic complexes. The agency issued orange and yellow alert levels for them, respectively. 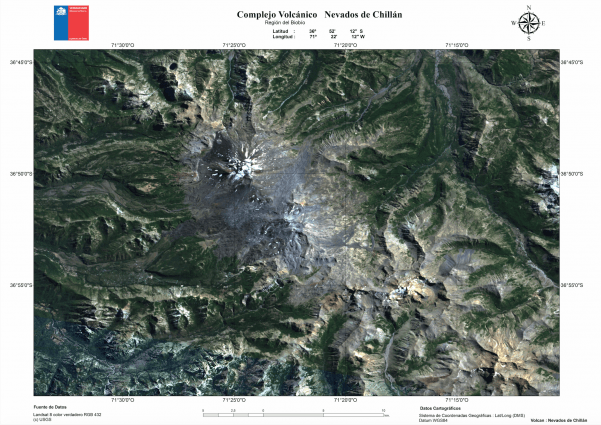 A satellite image of the Nevados de Chillán volcano complex, showing the glacier-covered volcano peaks. Image via Sernageomin. The Nevados de Chillán volcano complex is composed of several glacier-covered volcanic peaks. When these volcanoes erupt, the glacial ice sitting atop them melts and mixes with lava, which can result in dangerous lahars, or mudflows. Several small earthquakes and the formation of new gas vents led Sernageomin to issue a yellow alert on December 31, 2015. 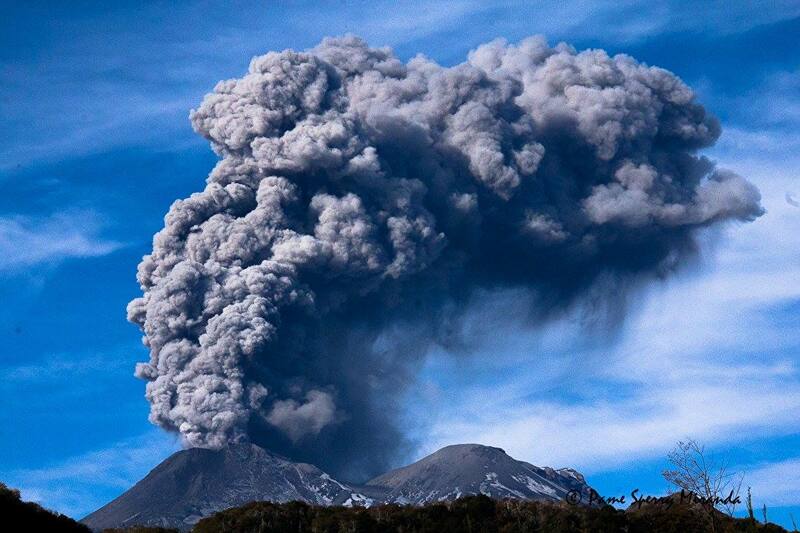 On April 5, 2018, Sernageomin upgraded the Nevados de Chillán’s yellow alert to an orange alert, following thousands of tremors and a thick, white column of smoke rising from the area. This signaled the likelihood of an eruption in the near future. Sernageomin’s most recent volcanic activity report for Nevados de Chillán, issued on February 11, 2019, cited persistent seismic activity, which is directly related to increased frequency of explosions, along with the growth and/or destruction of the lava dome that lies in the crater. The expected eruption is most likely to have moderate to low explosive power, but sporadic observations over the last year have shown higher-than-average energy levels. Bottom line: Recent increased volcanic activity in the Nevados de Chillán prompted Chilean authorities to issue an orange alert in anticipation of an eruption.